The best bathroom faucets may be inexpensive compared to a bathtub or hot tub, but they can complement or complete the bathroom style you’re going for. There’s also the practical aspect, as you need to repair or replace a leaky faucet. You should also get a faucet that’s easy to use and that matches your basin features. Centerset: This is the most commonly used type of best bathroom faucets, as it’s the cheapest and the easiest to put in. The handles and spout are combined on the 4-inch base unit. It’s appropriate for pre-existing or predrilled smaller basins. Single-hole: This is easy to install and use, and it’s mostly for smaller sinks. In general you only have one handle, but it’s possible to have separate handles for cold and hot water. Widespread: The spread is about 8 inches, although there are mini versions that have a 4-inch spread. It’s a bit more expensive in general, but you get more placement options. The valves for the cold and hot water are separate from the spout. Wall-mounted: This looks great, it reduces the sink clutter, and the cleanup is easier. However, the installation will probably require professionals. Aerated spouts mix the air with water. It uses a screen and restrictor to limit the water flow, while it boosts the water pressure. Nonaerated spouts, on the other hand, don’t use a screen and the water flows freely. This results in a flow that resembles a waterfall. This can be a lever, cross handle, joystick, knob, or push button. A few are even touchless electronic handles, which shut off automatically when you’re done washing your hands. Compression: This uses rubber washers, which may wear down and drip after a while. But they’re very affordable and easy to replace. Ball washerless: It uses a ball valve to control the flow, and it’s very reliable and long-lasting. This only works for a single-handle faucet. Cartridge washerless: This is also dependable and durable, and it’s easy to repair. You can use it for faucets with 1 or 2 handles. Ceramic disk washerless: This is a bit pricier, but then it’s dependable and can be used for faucets with 1 or 2 handles. It lasts for quite a while too, and frequently it comes with a long warranty. Your best bet is a finish with a lifetime warranty, so you know it won’t tarnish as time passes. Brass: This is a great traditional look, and with a lifetime finish it shouldn’t fade, rust, or get scratched. Chrome: This is affordable and durable, and the finish can be matte, brushed, or polished. Stainless steel: It’s a bit more expensive but it looks great and water spots don’t show. Nickel: It’s easy to clean, long-lasting, and great-looking. The finish can be satin or brushed. Gold plate: In high quality, it’s more expensive but it won’t tarnish. Colored finish: This may come with baked-on enamel or an epoxy coating. Either way, it’s easy to clean. PVD: It stands for physical vapor deposition. It’s extremely long-lasting, with great resistance against discoloration and abrasion. Some best bathroom faucets have extra features that make them more customized to your needs. For example, the anti-scald protection feature is great when you have young kids and elderly folks in the house. You can get a filtering feature so you save on bottled water. If you’re concerned about conserving water, you can get and adjustable flow-rate restrictor for more control over the amount of water you use. Some newer sinks also have a common-valve system that works for different types of faucets, so upgrading your faucet can be a matter of just unscrewing the handle and spout. However, all these special features can really raise the price. There are dozens of best bathroom faucet brands in the market introducing hundreds of best models. I have analysed them feature by feature, and picked the best 10 among them. This is a single-handle, centerset faucet with a waterfall spout and a matching cover plate.Eyekepper Modern Single Handle Faucet comes with a ceramic valve, and there’s a hot and cold switch. The flow rate is rated at 2 GPM. To install this faucet, the hole diameter of the sink should be within 1.3 to 1.77 inches (3.3 to 4.5 cm). It’s available in different finishes, which include brushed nickel, chrome, gold, oil-rubbed bronze, and white. The body and the spout are made from brass, while the handle is made from zinc alloy. The height of the spout is 4 inches (125 mm), while it is 5 inches long (135 mm). The overall height is 6 inches (160 mm), while the width of the spout measures 2.4 inches (60 mm). It looks very modern with its sleek lines and sharp angles, as it offers an overall rectangular look. It’s quite beautiful, in fact. The installation is simple and you get a nice water flow. In fact, it may be a bit too strong so you should be careful about opening the faucet at first. You may get splashed. It also comes at a very attractive price, as it comes at about half that of the cost of a Moen. You can return it and get a refund for just about any reason. The Moen brand is among the most well-known in the industry, and a lot of plumbers tend to recommend it (even though they don’t exactly get a commission). But then again the Moen brand is known for its beautiful bathroom products, and these items can go for years without needing repairs. In addition, all Moen faucets (which include this one) are WaterSense-certified. WaterSense is for faucets and other bathroom furnishing in much the same way that Energy Star is for electronic appliances. It’s all about conservation. With this rating, it means you get the same faucet performance but you use up 32% less water. Part of that is the more controlled flow rate, which is limited to a maximum of 1.5 GPM. This is also quite easy to use. In fact, it’s compliant with the ADA (Americans with Disabilities Act). Now Moen T6620 Brantford Two-Handle Faucet is more of a dress up for your faucet, as it doesn’t have the needed valve 9000 included as part of the purchase. But everything else (including the tool needed for the aerator kit) is included such as the metal pop-up drain assembly. It’s designed for 8 to 16-inch widespread installation. In the middle stands the low arcing spout with its gentle curve, while at the sides you’ll find the handles for the hot and cold water. You just have to rotate the handle 90 degrees to get full water flow. You have 3 available finishes: brushed nickel, chrome, and oil-rubbed bronze. It does look great, and its looks can really last. One buyer who lives near a Florida beach says it hasn’t rusted after 3 years. So yes, it’s a bit pricey and you don’t even have the valve yet. But it’s Moen, and that’s all you need to know about its quality. This is really available in several finishes. For more homey and traditional homes, the black and the appropriately-named antique brass look just right. But for modern urban homes, the shine of the polished gold and the chrome will work well to complement the look. There’s also the brushed nickel, which somehow works with every style. Oil Rubbed Bronze Waterfall Bathroom Faucet comes with a spout that comes out horizontally instead of downwards, with the cylinder extending by 3.8 inches (98 mm). So you need to take into account how and where the water will drop into the basin. Many have discovered that it pays to lower the water pressure by turning the valve under the sink, since suddenly turning this on to full blast will just splash you. The spout’s elevation is at 3.93 inches (100 mm) from the base, and the overall height of the Rozin sink faucet is 9.05 inches (230 mm). There’s a curved lever on top, which you can use to pick between the cold and hot water pipes. You just lift it up, and then turn from side to side to choose between hot or cold water. For this, you will probably need a pro for installation, and the custom fittings such as O-rings and supply lines need to come from the seller. It’s easy to use, quite attractive, and very economical. Designers Impressions 652369 Faucet can also come in polished chrome or satin nickel. With oil-rubbed bronze, the look is more subdued so it’s very suitable for more traditional and homey bathroom designs. The finish is very durable with no problems about peeling or flaking, although it comes with a set of cleaning instructions. The set comes with 2 handles for cold and hot water, plus a drain fitting to match the look of the faucet. A lot of factors set this faucet apart from the competition, aside from the economical price and the good looks. First of all, it doesn’t use washers, so there shouldn’t be any problems with dripping after just a short while. It’s also easy to install yourself, although you need to have some common household tools handy. It meets a bunch of ANSI and ASME engineering standards, so it’s literally not a substandard faucet from some no-name company. And it even complies with ADA requirements, which proves how easy it is to use. Peerless P131LF Classic Single Faucet almost seems like a commercial faucet that you’d find in a mall bathroom. The simplicity of the design and the chrome finish is inoffensive and understated, but there’s an undeniable elegance to it all the same.It’s rather small, with the spout angling 45 degrees upward while the water goes directly down. It needs a 0.5-inch IPS connection for the valve, and you’re good to go. It’s easy enough to use even with one hand, and in fact it’s also ADA-compliant like most public bathroom faucets. It is water-efficient too, as it allows for just 1.2 GPM. The understated looks and the simplicity of the design make it eminently ideal for those who don’t really understand the brouhaha over faucet choices. For some people, a faucet is just a faucet, and not a crucial design element. This is perfect for you if it’s enough that it works easily, it conserves water, it looks good enough, it’s easy to install, and it’s affordable. Come to think of it—these attributes cover most of what people are looking for in faucets! As the name says, The Premier 126960 Waterfront is a 2-handle faucet so you have separate controls for cold and hot water.It comes in either a brushed nickel (with PVD) or chrome for a shinier look. It’s a tiny faucet, and it measures about 6 inches across and forward. The handles are thicker at the end for a better grip, while the spout gently curves downward. To install it, you need holes that are 4 inches apart. The connections are 0.5 inches. It doesn’t use washers, so it should be reliable and you shouldn’t have drip problems so soon. It’s extremely reliable. The inlet shanks have been reinforced with brass, while the lead-free waterway is made from special high-density polymer that’s resistant to corrosion. This is WaterSense-certified, with a flow rate max of just 1.5 GPM. Basically, this is another simple looking faucet, which should appeal to those whose tastes gravitate towards understated designs. It’s enough that even though it’s very affordable, it’s easy to install, work well enough, and lasts for a very long while. If you’re tired of faucets that look so similar to each other, then Aquafaucet Widespread Bathroom Sink Faucet may appeal to your need for variety.But it’s not an overly complicated design, as it’s actually quite simple. Take a thick metal ruler or yardstick, and plant it upright on the basin. On the other end, bend it so that you have a curving hook. That’s the spout, and basically it looks like the traditional curved handle of an umbrella. This design is very rarely seen in hardware stores, so it’s really a very unique design. So it’s great for guest bathrooms too, as your visitors will probably take note of it since they’ve probably haven’t seen anything like this design before. It’s easy enough to install for those with DIY experience, as you just need the 3 holes on the basin. It comes with the valve already, although there’s no matching drain fitting. The water flow is wide and it looks nice, like a waterfall. The spout measures 6.7 inches (170 mm) long, with a height of 6.1 inches (155 mm). The hands on the side complement the spouts rectangular look, since you have a pair of rectangular chips as your handles. The body, spout, and handles are made from brass, and it’s available in several finishes, such as chrome, brushed nickel, or bronze. Now if you want one of the best bathroom faucets that will grab anyone’s attention, it’s this waterfall sink faucet. The Harrahs 1001 Deck Mount Faucet comes with an upright rectangular cylinder and it’s topped by the wide horizontal spout that curves downward at the end. At the topmost there’s the lever handle, and again you have the rectangular design to complete the look. The spout is 7 inches high and the entire apparatus is 10.7 inches tall. The spout’s reach is 5.35 inches. It only comes with one handle, but that’s enough for both hot and cold water. The faucet installation just needs one hole, with ⅜ or ½-inch hose connectors. So it should be easy to install. The faucet comes with a polished chrome finish, so it’s as shiny as a mirror. It’s made of solid brass, so it should last for a while. It also uses advanced ceramic disc valve technology so you won’t have leaks. What really sets this apart is the entire spout comes with LED lights. Seriously. It can really make a bathroom seem festive, and it can match your showerhead if it has LED lights too. The lights are bright, and even in the day you’ll notice them. Kids love them, and older folks like your parents will probably be intrigued by this new technology. But it’s not just for the looks either. It’s also informative, because the light is blue if cold water comes out. The light turns red when it’s hot water. For those people who get confused as to which side of the handle has the cold or hot water, this feature is quite nifty. And it doesn’t even need batteries. Imagine a brick or a rectangular cylinder as the base, a rectangular plank that curves gently at the end for the spout, and a hefty rectangular lever at the top. That’s the basic design of this KES® L3109A Single Handle Faucet. For your finish, you can choose between chrome, brushed nickel, titanium golden, and oil-rubbed bronze. Turn it on, and you get a waterfall from the spout. The entire faucet measures 6.5 inches to the top of the handle. This is made from solid brass for durability, while the finish can resist tarnishing, corrosion, and scratches. It uses a ceramic disc cartridge for long lasting smooth operation. This cartridge has been designed to last being opened and closed up to 500,00o times. The water pressure has been tested too. For installation, you need a single hole on the basin. If you have 3 holes, you can just put it on the center hole, while you cover the side holes with stainless steel or chrome plugs. The purchase already includes the required 23.6-inch (60 cm) hot and cold water hoses with the ⅜-inch female compression thread. LDR 952 46405BN Exquisite Bathroom Faucet, another basic and simple faucet. The spout is rather like a curved pipe, with accents at the base and at the end of the spout. The handles come in simple cylinder shapes at both sides of the spout. So in sense it’s a simple design, but it’s not quite like the ubiquitous faucet designs you see everywhere. It’s a 4-inch center set, so it should be fairly easy to install yourself. This is made of plastic, but it complies with just about every federal and state low-lead laws, as it is completely lead-free. It’s affordable (it’s made of plastic after all), but it’s built well enough. Besides, the finish makes it look less plastic-like. Even without knowing the price, it actually looks nice. When you know how affordable it really is, you’ll feel as if you got a bargain. As you can tell, there’s just about every kind of faucet available for any kind of function and look you want. It doesn’t matter if your bathroom looks modern or traditional. Some faucets come with understated elegance, while others (such as the one with the LED lights) are guaranteed to get the notice of guests who see them. Many are very easy to use (especially the ADA-compliant), and lots of them are easy to install yourself. So don’t just let your bathroom designer or builder get the cheapest faucets. 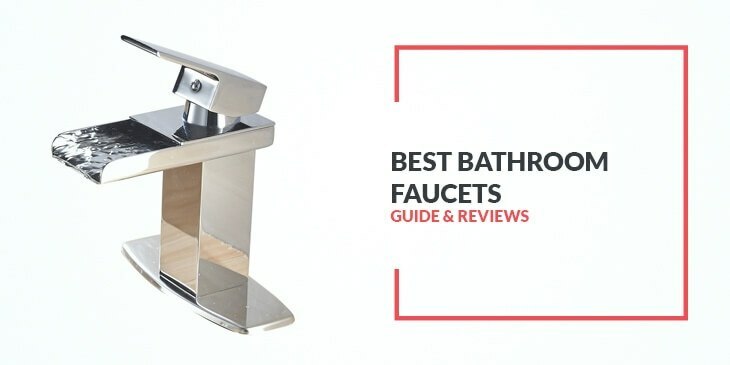 Take the time to pick the best bathroom faucets. You’ll appreciate them more when they work flawlessly while they accentuate the look of your bathroom.